Ten days ago, Cruise West announced a new cruising concept that will see its Spirit of Oceanus follow in the wake of the Stella Polaris, that for so many years cruised the world in luxury carrying no more than 199 guests. Now, the similar-sized Spirit of Oceanus will start a 335-day circumnavigation in March 2010 carrying just 114 guests. While most world cruises typically leave in the first week of January, Princess is also experimenting with cruises that leave outside the usual sailing dates and have a 104-day world cruise planned for the Dawn Princess, for example, leaving Sydney in an eastbound direction on July 5. Seabourn will also conduct its first world cruise, a 108-day affair, leaving on January 5 next year, after they take delivery this month of their new 450-guest Seabourn Odyssey. But unless one considers the privately-owned suites on board The World of Residensea to be the equivalent of a cruise ship, no one is doing what Cruise West is doing, taking almost a year to circumnavigate the Earth. An interesting comparison can be made of the Spirit of Oceanus with the old Stella Polaris. Of generally similar size, both were first delivered to Norwegian owners and both powered by twin Burmeister & Wain diesel engines, even if built 64 years apart! Stella Polaris measured 5,209 gross tons. Delivered by AB Götaverken, Gothenburg in February 1927, she had dimensions of 360.5' x 50' x 30', and was powered by twin 8-cylinder B&W diesels delivering 5,250 brake horsepower and a speed of15.6 knots. She carried 199 passengers, later modified to 155. Built for the Bergen Line, Bergen, she passed to Clipper Cruises in 1952. Spirit of Oceanus measures 4,200 gross tons. Delivered by Nuovi Cantieri Apuania, Italy, in January 1991, she has dimensions of 295.5' x 50.1' x 28.2', she is powered by twin 8 cylinder B&W diesels deleverinf 5,000 brake horsepower and a speed of 16 knots. She now carries 120 passengers. Built for Fearnley & Eger, Oslo, she passed to Cruise West in 2001. With her yacht-like bowsprit, the Stella Polaris was quite a bit longer than the Spirit of Oceanus but the two ships hull dimensions would be fairly similar. The Spirit of Oceanus also has a zodiac launching platform astern and a new owners suite installed on the top deck above the bridge. After being delivered in early 1927 to the Bergen Line, a company founded in 1851. The Bergen Line would later become one of the three founders of the Royal Viking Line. On her arrival on the scene, the Stella Polaris became one of the world's most luxurious cruise ships, embarking once a year on a full world cruise that left New York in January after a Christmas cruise to the Caribbean. 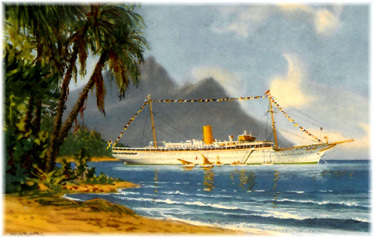 There, along with the British-flag Arandora Star and Vandyck and Canadian Pacific's Duchess of Richmond, she became one of the first cruise ships to call on Miami. 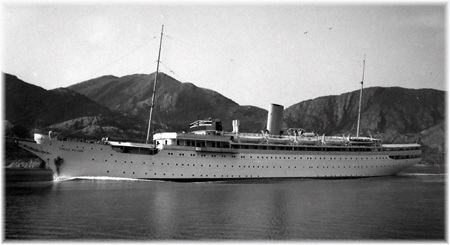 During the summer months she cruised in Europe, usually to the North Cape and Norwegian fjords, which she did until 1939. In 1940, she was seized by the Germans and used as a recreation ship for U-Boat crews. After the war, the Bergen Line sent the Stella Polaris back to Gotaverken for an almost complete rebuild and she re-entered service on the same formula until being sold to the Clipper Line of Sweden in 1952, when her capacity was reduced to 155. 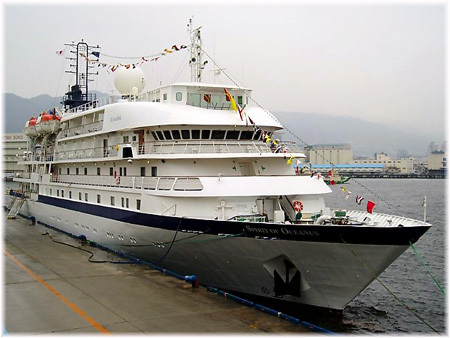 In 1969, Clipper sold her to Japanese interests who used her as a floating hotel and later restaurant at Kisho Nishiura. Repurchased by Swedish interests in August 2006, she unfortunately sank in Japanese waters the next month while being towed to a shipyard to equip her for the long tow back to Stockholm, where she was to have been used as a floating hotel and restaurant. The Spirit of Oceanus was one of eight luxury cruise ships completed for Fearnley & Eger, Norwegian shipowners that dated back to 1869. Two sets of four ships each were built in two different shipyards for a new cruising company called Renaissance Cruises and the one that became Spirit of Oceanus was delivered as Renaissance V in 1991 . Fearnley & Eger had earlier been involved in the cruise market through a partnership in Flagship Cruises, which built two ships for the New York-Bermuda market and later purchased Swedish American's Kungsholm. All three were later sold to P&O for their Princess Cruises division. Fearnley & Eger had also converted one of its own roro ferries into the cruise ship Explorer Starship to trade in Alaska. This ship became better known later as the Song of Flower. But the delivery of eight ships in such a short period unfortunately led to the demise of Fearnley & Eger. Renaissance Cruises would survive under different ownership until a similarly ambitious scheme to build eight larger cruise ships in turn bankrupted them in 2001. 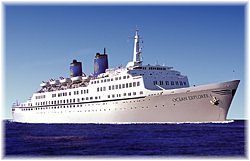 Having been owned by Sun Cruises and then Star Cruises, the Spirit of Oceanus was finally acquired by Cruise West in 2001, becoming the largest ship in their fleet of Alaska small ships. Until now, Cruise West has been sending the Spirit of Oceanus to the South Pacific, Japan and the Far East during the North American winter season, but with the recent downturn in the Alaska market, the cruise line has come up with an entirely different program for 2010. Cruise West has divided this epic voyage into six sectors that it calls "chapters," one each in relation to Marco Polo, Odysseus and the Phoenicians, Leif Eriksson, Columbus, Cook and Magellan, offering in total 24 cruises that start from $4,995 per person. Chapter 1: Marco Polo - March 6 - May 5, 2010. Four enticing voyages recall the ancient trade routes from Southeast Asia to the Mediterranean Sea. Departing Singapore, these itineraries visit Thailand and Burma before exploring the Indian sub-continent and Sri Lanka. Then it's on to historic Iran, the United Arab Emirates, Oman, Jordan and Egypt, before concluding in Alexandria. Chapter 2: Odysseus and the Phoenicians - May 5 - July 20, 2010. These six voyages explore sun-drenched islands where gods and goddesses once meddled in the affairs of mortals. Beginning in Alexandria, the ship sails to mythic destinations in Greece and Turkey while guests can also visit Tunis, Algeria, Italy, Sicily, Malta, Spain and Portugal before arriving in Honfleur, France. Chapter 3: Leif Eriksson - July 20 - September 8, 2010. Inspired by the heroic exploits of the Vikings, these three voyages combine glaciers, capital cities, and days at sea between two continents. Departing Honfleur, France, explore Ireland, the Orkney Isles and Scandinavia as well as the enchanting cities of Tallinn, St. Petersburg, London and Edinburgh. Crossing the Atlantic, she stops in Iceland, Greenland and the Faroe Islands before ending up in St. John's, Newfoundland. Chapter 4: Christopher Columbus - September 8 - November 2, 2010. Five memorable voyages bring the New World into a new perspective. Depart St. John's, Newfoundland and cruise along the Atlantic coastline, and transit the Panama Canal. With the ease offered on a small ship, explore the tropical rainforests of Panama and Costa Rica before disembarking in Guayaquil, Ecuador. Extensions are available to the Galapagos Islands and Machu Pichu. Chapter 5: James Cook - November 2, 2010 - January 19, 2011. Cruise the South Pacific from Easter Island to Darwin, in waters Captain Cook once charted. Unknown to many, Cook had also surveyed the waters of the Gulf of St Lawrence off Newfoundland, where Spirit of Oceanus sailed before heading south again. These five voyages feature remote islands with pristine beaches, fabulous snorkelling and fascinating local cultures in Easter Island, Polynesia, New Guinea, the Cook Islands, New Zealand and Australia, ending in Darwin. Chapter 6: Ferdinand Magellan - January 19 - February 3, 2011. The final chapter of the Voyages of the Great Explorers departs from Darwin bound for the port where the journey began in Singapore. Along the way explore intriguing cultures throughout Indonesia that combine Hindu, Islam, Western and indigenous influences, and wildlife ranging from the extraordinarily beautiful to the wonderfully bizarre. Guests booking the full 335 days, visiting 242 ports in 59 countries, will also be given First Class air fare to and from Singapore. The exploration-style journey will include 85 UNESCO World Heritage sites and cross fourteen seas and oceans, and transit three canals -- Suez, Corinth and Panama. The all-suite Spirit of Oceanus is Cruise West's most spacious and luxurious ship, offering gracious comfort for 120 select guests. Each suite offers spacious closets, a large marble bathroom, sitting area and television. Two lounges, an outside bistro and an open-sitting dining room provide a casual onboard atmosphere. Seven suite categories are offered, including fourteen with private balconies and one spacious Owner's Suite on the ship's Sun Deck. Both her masters come from world-circling backgrounds with Cunard Line and Hapag-Lloyd Cruises, two of the earliest promoters of world cruises. In 1999, in order to celebrate the Millennium, the World Cruise Company introduced a single ship intended to make three world cruises a year, of 127, 116 and 118 days, according to the season. Starting with the Ocean Explorer I, the venture was hit by a spike in the price of oil that cost it $1 million a circumnavigation. Although the line then chartered smaller, less fuel-thirsty ships, it had not hedged against the rising cost of fuel and ended up in bankrupcty in 2000, taking associated adventure company Marine Expeditions down with it in 2001. 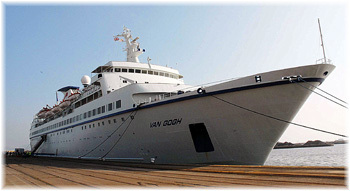 A similarly unsuccessful UK company, Travelscope, succeeded in selling out a few world cruises on out of season dates, using first the Athena and then the Van Gogh in The venture, although it stumbled along for a while as Van Gogh Cruises after a ship arrest in 2007, eventually went bankrupt in early 2008. Other mooted ventures did not even get started. Some of the more successful lines, however, have also from time to time set off on world cruises outside the usual leaving time of the first week of January. The Dawn Princess, for example, will leave Sydney once again, in a westbound direction this time, on May 21, 2010. How many from the northern hemisphere might want to join a world cruise in Sydney is an interesting point, but of course only so many book the full cruise. 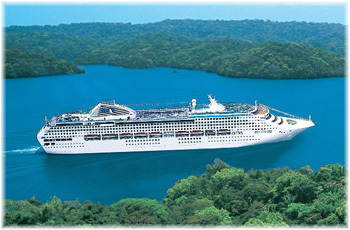 The Dawn Princess is one of two Princess ships that are now based year-round in Australia. While 335 days may be a bit too much for most world cruisers, the Spirit of Oceanus voyage, divided into 24 cruises with 242 port calls, does offer a tremendous opportunity for explorers who might wish to see parts of the world they have never seen before. Following on the 100th Anniversary of the first world cruise, which was performed in 1909 by the Hamburg America Line's Cleveland, it will be interesting to see whether the Spirit of Oceanus will now develop a following similar to the Stella Polaris, and whether this voyage will become an annual event.